While the entire country was on the Holy Week vacation, Rina's job unfortunately required her to work. Luckily though, her shift doesn't start until 3pm, and she can do her work from home. (I should seriously start looking into that. Imagine how much I could save on my water bill, not needing to shower before going to work!) I told her that I wanted to take her and Baby Rain out for lunch so we could get home before her shift started, so we don't go all "The Shining" staying in the house throughout the break. Chaikka, who was getting bored out of her mind at home, had said that should we have any plans, to let her know right away, and no matter what it was, even if it was a midnight Magnum run to our villages' Mini Stop, she was in. I had done a little research before the break began, so I had an idea of what restaurants would be open during the Lenten season, and one stuck to the back of my mind. 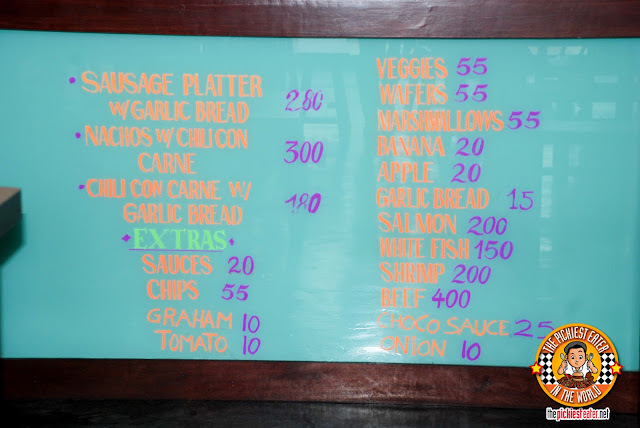 After a leisurely driver around The Fort and Ortigas, I decided it was time to give that restaurant a try..
Eleven Tables is a quaint restaurant around the Kapitolyo area that got its name by having, yep, eleven tables in its restuarant. It's located on the ground floor of D' Ace Plaza (Not to be confused with THE Ace Plaza.. remember.. D'Ace Place with a capital "D"..) where Ace Water Spa is located. 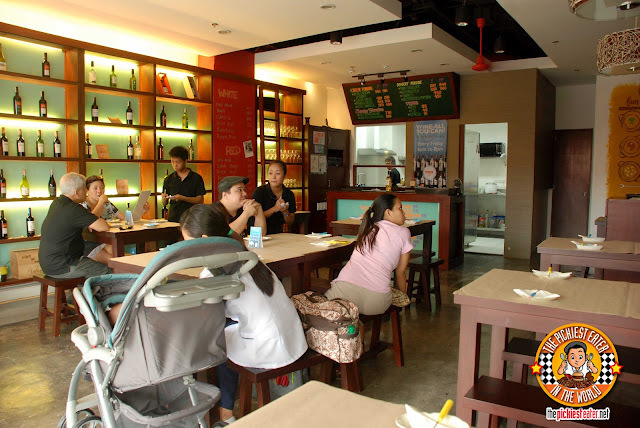 the Truth be told, in my opinion, the place is actually large by Kapitolyo restaurant standards, because I didn't get the cramped feeling I did when I was at Mad Mark's. My only hesitation about going to Eleven Tables was, based on their menu I saw online, their menu pretty much consists of different types of Fondue, which was fine for me, but Rina gave me explicit instructions that whenever Chaikka is with us, RICE MEALS ARE A MUST (My apologies to some of my favorite places, such as Sandwicheese and Chuck's Deli). 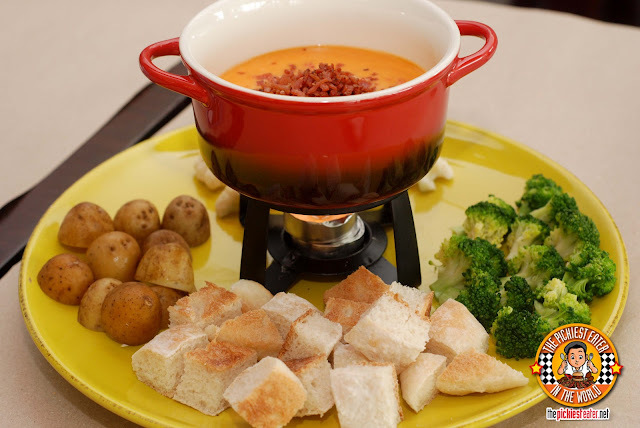 However, Chaikka said she's trying to cut down on her intake of rice, and she had never tried fondue before, so she was game. 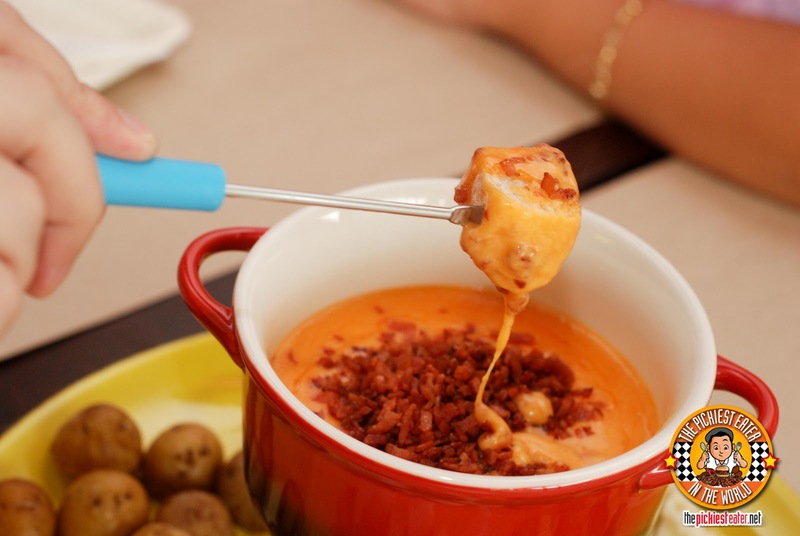 For our appetizers, Rina and Chaikka chose the Bacon, Cheddar and Tomato Cheese Fondue (P340 for two, P600 for four). The platter consists of pieces of Marble Potato, cauliflower, Broccoli and bits of bread (I think it was sourdough focaccia). I was actually a little apprehensive about ordering the sole cheese dish with tomato, but the fact that it was also the sole cheese dish that had the word "Bacon" in it trump all those rumblings in my mind. 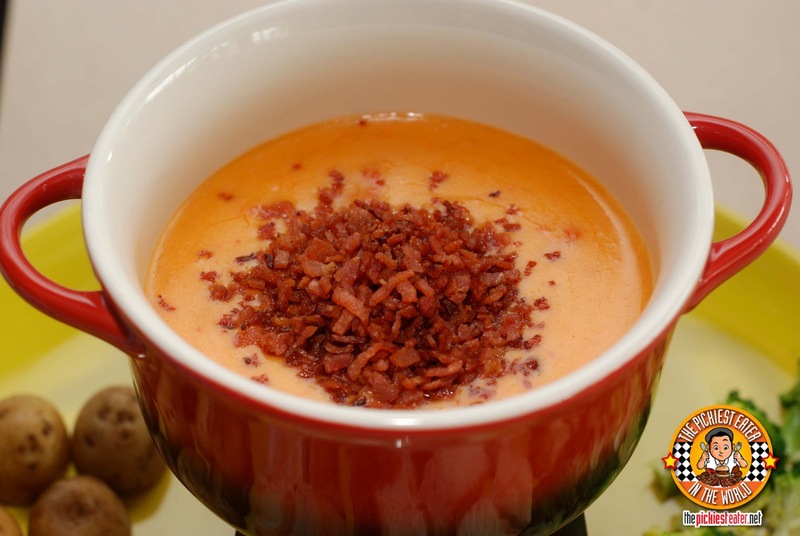 The mixture of the cheese, bacon and tomato made anything that I dipped into the fondue taste like an awesome pizza. I enjoyed the potatoes as they were cooked very well, with it being soft and easy to bite, but my only qualm was, it was a little cold still in the middle. The bread, however, was by far my favorite. 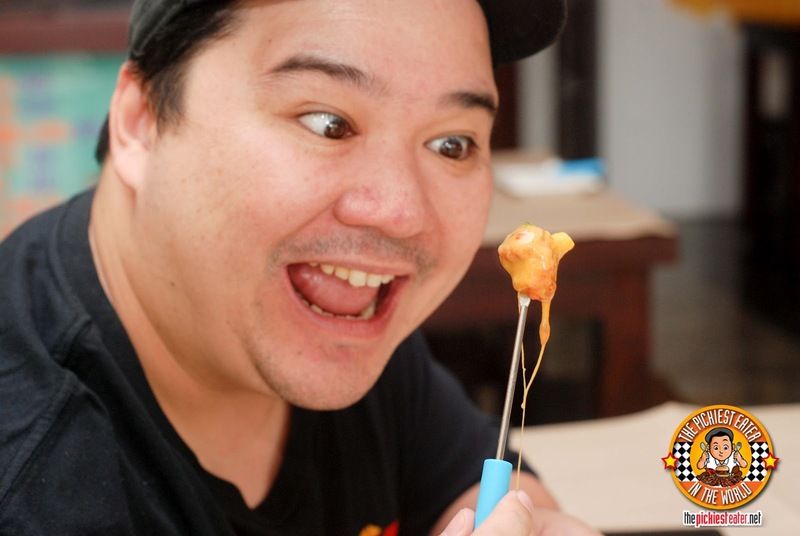 To me it was the perfect compliment to bring out the rich flavors of the gooey cheese, the wonderful smokiness of the bacon, and the tinge of acid from the tomato. I loved the cheese so much that even after the bread and potato were gone, I was still craving for some more. I was thinking about ordering more potato or even garlic bread so I could dip it into the sauce, but Rina says, "There's still a few more pieces of Broccoli left, why don't you eat that?" I pointed out to her that there's a reason why there was broccoli left, and no more bread. She rolled her eyes, too my dipping fork, pierced a piece of broccoli, dipped it into the pot of melted cheese and handed it back to me and said, "You won't even taste the broccoli". She was right. The cheese and bacon totally overwhelmed the broccoli, making it edible to my standards. And that is the story of how Rina and Eleven Tables got me to eat Broccoli for the first time in years. 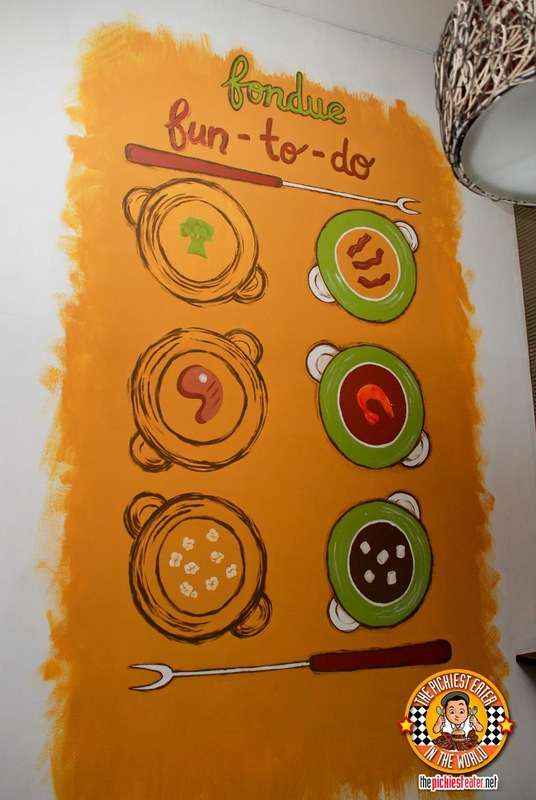 Eleven Tables has two main course Bourguinonne Fondue options, Seafood (P880) and Beef (P780). Naturally, we choose the Beef. The platter included more broccoli (I told Rina I reached my broccoli quota for the year), potato and cubes of Squash.. which was good because of its natural sweetness, Squash is actually one of the few dishes I actually like to eat. 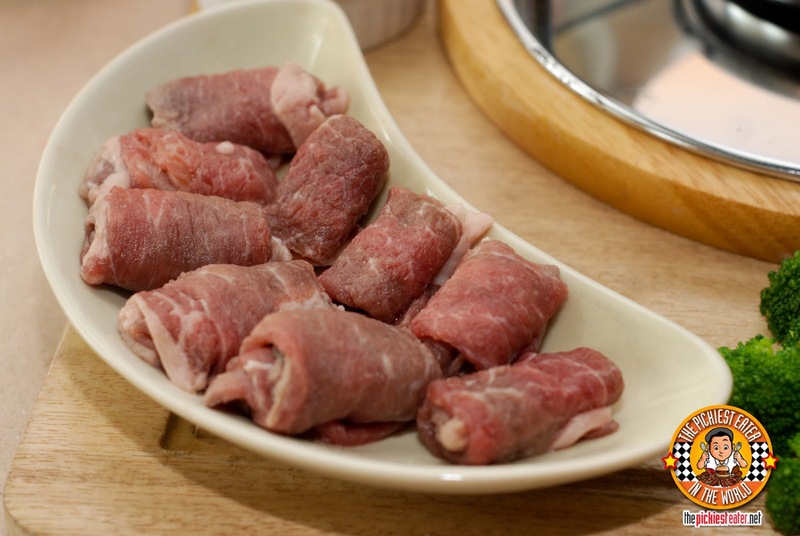 The Beef Bourguinonne are thinly sliced pieces of rolled beef that you dip into the hot pot, and within seconds, its ready to eat. 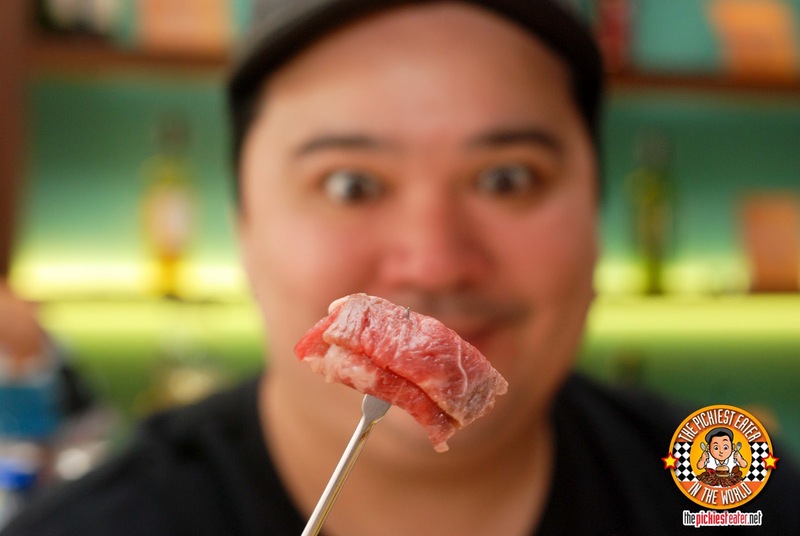 The texture of the meat was extremely tender and juicy, but at first I was thinking that it could have used a bit more seasoning. But that's exactly what their three different kind of sauces were for. The Mushroom sauce was not pretty to look at, but had a wonderful subtle flavor that brought out the savory goodness of the meat. The Mustard gave a strong tanginess that made sure it didn't overwhelm the beef. 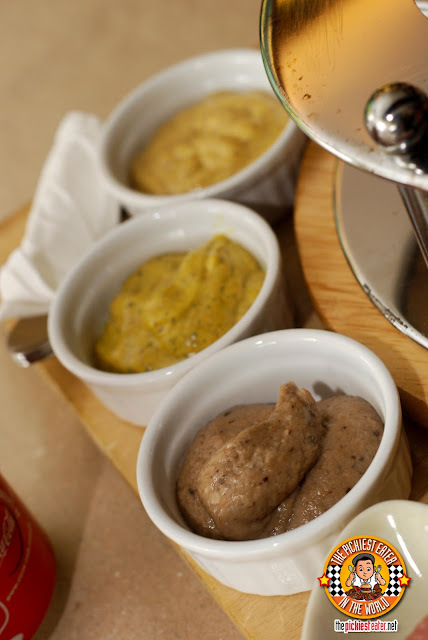 The Kefir Curry sauce, had that nice blend of herbs and spices that I love in a curry, without the heat.. and was probably my favorite. 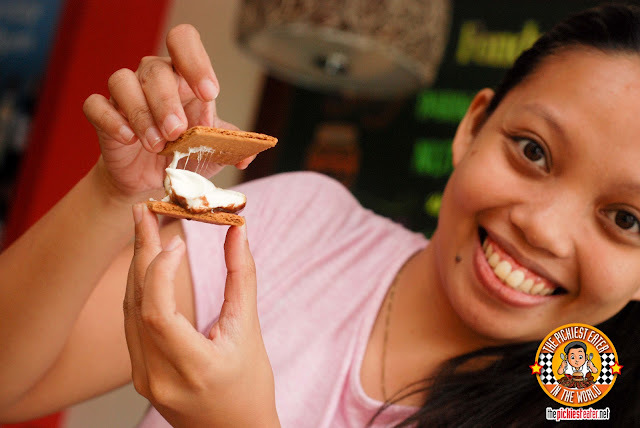 There are so many wonderful desserts that we wanted to try, but we finally decided on the S'Mores (P180). 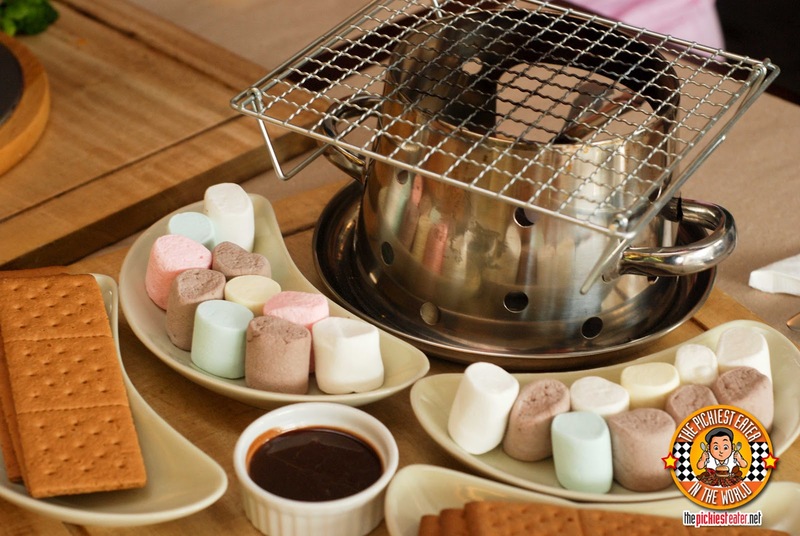 The platter included a whole bunch of Marshmallows, Graham Crackers, and a chocolate dipping sauce. 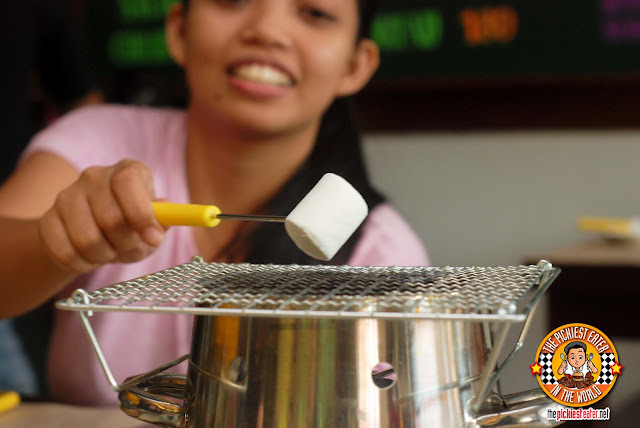 S'mores is the popular campfire treat in which you roast a marshmallow over the fire, snap off a piece of chocolate, then sandwich both in between two graham crackers. 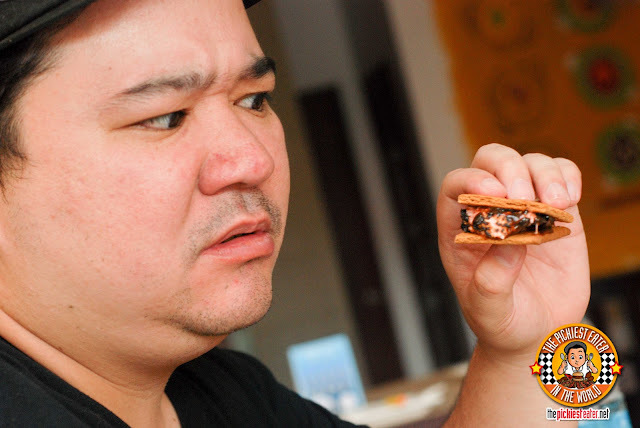 In Eleven Tables Version, they don't give you a piece of chocolate. 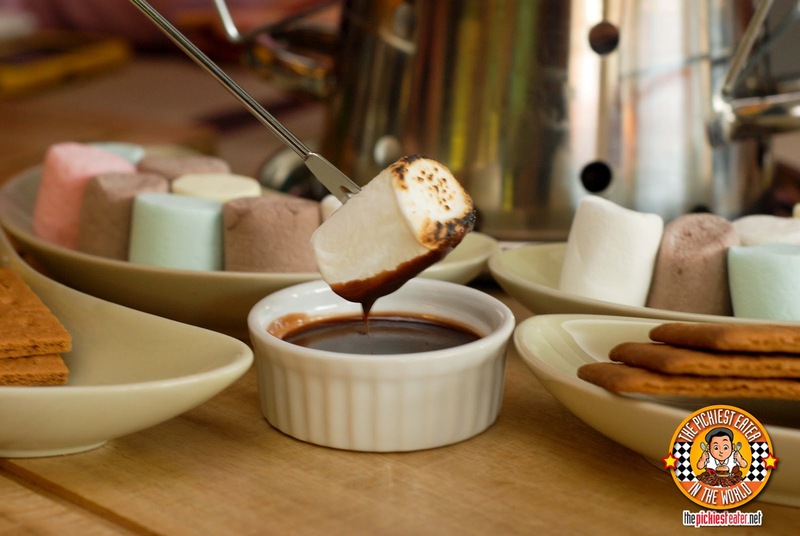 Instead, they give you a small bowl of melted chocolate that you just dip your marshmallow in, or pour over.. it's up to you. so I got excited to try making mine. but I assure you that it still tasted phenomenal! 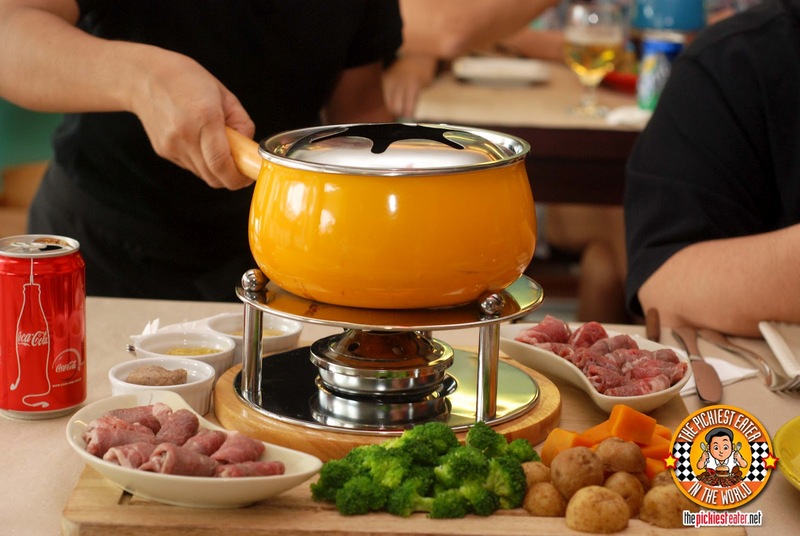 On the whole, Rina and Chaikka enjoyed their first fondue experience. My mom makes fondue as well, and is probably just as good, but that doesn't mean I didn't enjoy my meal here either. 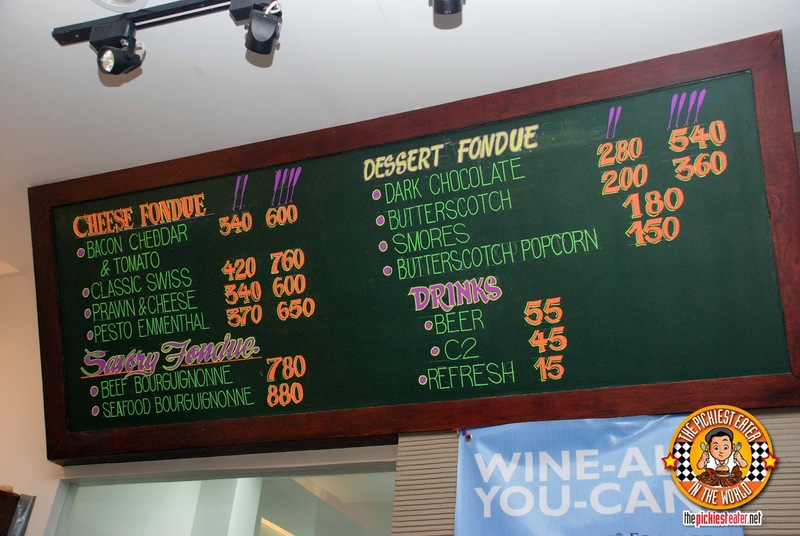 My only note is that I don't really get full with fondue, especially since they don't have rice available in their menu, so after forking out almost P800 bucks for some delicious beef, I was hungry three hours later. But I think that has more to do with my appetite than Eleven Tables' quality of service because the food was actually exceptional. I'd love to come back for the desserts, especially the Butterscotch Popcorn and the Nutella Fondue! Isn't my Baby Rain so pretty?? We should plan a food trip with the other bloggers as well so we can all meet! Midge, you had me at "Bacon Fat", but everything else sounded spectacular as well!! And Baby Rain should already get a talent fee from you.haha. :) ang cute cute!!! haha Michy don't give her (or her mom) any ideas!! wow the desserts look yummy!! 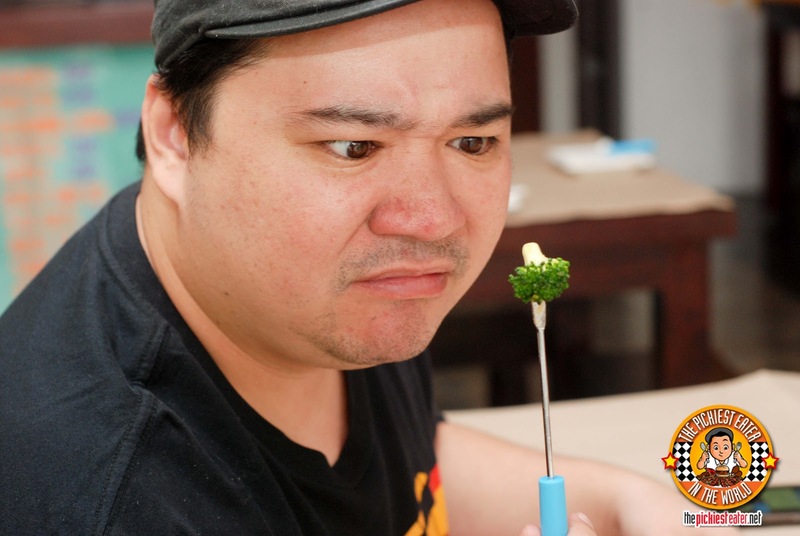 i love the "look" at the broccoli. LOL!!! I couldn't help it! haha! SEE thats what I said!!! 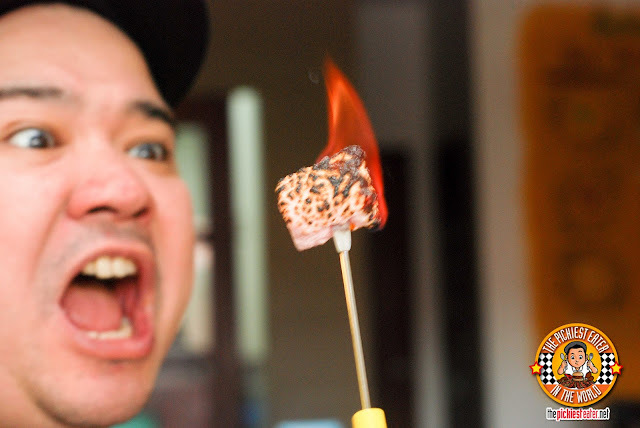 i love the bitter char flavor with the sweetness of the marshmallow! Richie!!! Your daughter is such a gem! She's so pretty! You must be prepared for her adolescent years! Thank you Meedge! Don't worry i'm applying for a gun license already!! haha!! YOUR DAUGHTER'S SO CUTE!! 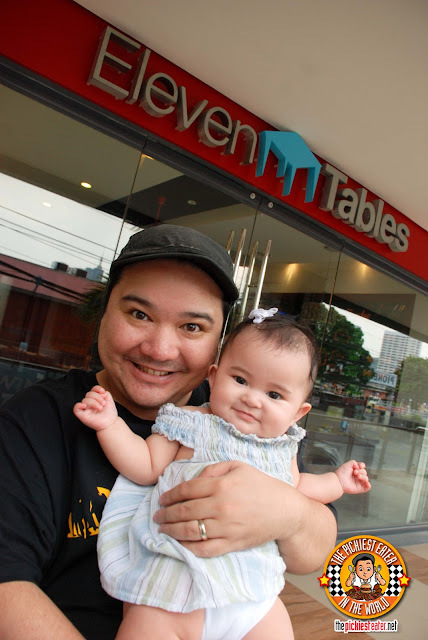 Been meaning to try Eleven Tables but are the servings really that tiny? Nice site you got there! haha! and just when you thought high performance automobiles and precision watches were proof enough!